Free San Marino map for you to download! Special note : this map is reproduced here through the kind generosity of the San Marino Site. It is protected by copyright and must not be reproduced without their permission. 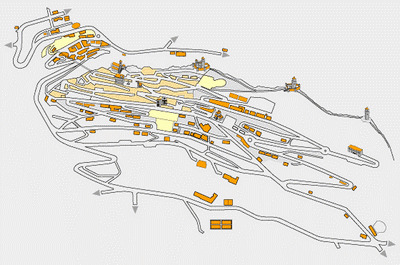 Struggling to find a good map of San Marino's historic centre? Here is a detailed San Marino map (pdf version) for you to download now! Look for a map of San Marino in a bookshop and you won't find a thing. This tiny enclave in the middle of Italy just isn't big enough for anyone to think it worthwhile. Local people would probably agree - it's just not big enough for people to get lost in San Marino. And anyway, one of the nicest things about visiting, as with many Italian towns and villages, is just wandering through soaking up the culture and atmosphere and stopping for the occasional coffee or nice cold glass of wine. The rooftops of San Marino's historic centre. However, as we found to our cost when we visited for the first time, it's easy to miss striking landmarks if you don't have some kind of guide. You may not be particularly interested in searching out the town hall but it's nice to know, when you do stumble upon it, what it is. This San Marino map is a reproduction of the signs you'll see all around the old part of the town. The difficulty with those is, you can't pick them up and take them with you. It comes in PDF format which means you can zoom in or out as much as you like. It gives a numbered directory of places to park, stay and eat and a good indication of which roads to follow to reach the castle at the very top of the mountain, from where you'll have the most spectacular views of the beautiful surrounding countryside, as far as the Adriatic coast. Click on this picture to go to the large map which will open in a new page. Be patient - it's a large file and may take a few minutes to download. Make it as large or as small as you want by using the 'zoom' facility. Download - and enjoy your visit! We recommend the San Marino website to anyone planning to visit - it's packed with useful information, great photographs, and it's available in English as well as Italian.